Steady state operations on process plant prevents many technicians/supervisors from learning basic start-up and shutdown procedures and processes, as well as maintenance isolations and fault finding. Our simulator based training allows delegates to work on process plant with total safety and freedom exploring areas such as alarm, trip & ESD envelopes. The simulator environment allows the instructor to introduce faults, providing delegates with experience and confidence to approach on-plant activities. 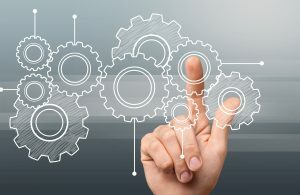 Within the training room we can provide training and assessment from basic systems through to complete plant start-up / shutdown and fault finding. The basic models take ~3 hours per candidate, with complex training courses lasting several days. We provide multiple short courses on basic control principles to build up knowledge, which are used in the bigger simulators. 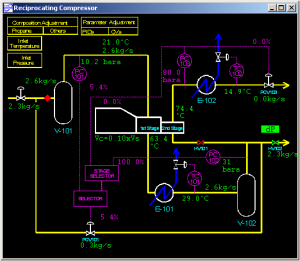 For example the PID Level Control model consists of a liquid vessel with single feed and exit streams. The feed to the vessel can be varied by opening an additional feed stream. The vessel is open topped and will overflow if overfilled. A control valve on the exit line is used to set the liquid level in the vessel. A THREE term controller is used to control the valve position. Other short courses include flow pressure & level control, temperature across an exchanger , direct and cascade control and basic pump systems. 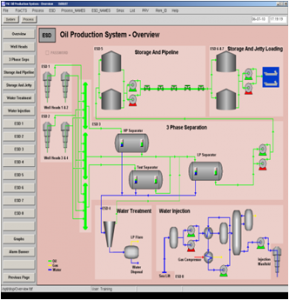 This major process simulator covers plant and equipment such as : wellheads, 3 phase separation, water treatment, water injection, storage and pipeline and storage & loading. 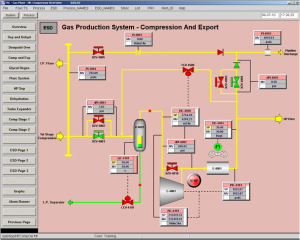 This major process simulator covers plant and equipment such as : Separation & Dehydration, Dew-point control, glycol regeneration, compression and export and the flare system. 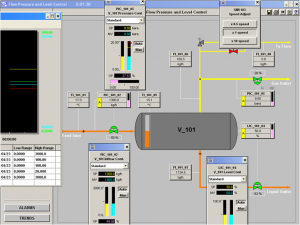 A course that covers all our simulators covering basic control principles to major systems. A competence assessment at the end of the course using one of our major plant simulators. This course is suitable from anyone : from admin to a CRO. This course covers start-up and shutdown functionality, with a section of fault finding after instructor causes plant ‘upsets’. Alarms and ESD functionality covered. There are 4 hands-on simulators that a team can use as well as individually for training. This course is suitable for anyone : from a trainee to an experienced CRO. There is always an experienced instructor with the process simulators, and fun team building events can be provided, for example our on-going competition. our process simulators are portable and we can set up in your workplace, please contact us for details. Anyone can attend this fun course, which can be an hour long in order to let everyone experience the process simulators. You can book courses on-line that are held regularly in the Aberdeen area, if you don’t see a date that suits please just contact us. There is also a calendar view for courses. We have a portfolio of eLearning CBT courses that can be purchased on-line. If you don’t see what you are looking for please contact us as we are continuously adding to our e-Learning portfolio. We can mobilise to any location for any of the courses, please contact us for a price for your event. We can deliver simulator and blended learning courses as requested.